Gannet Rock lies about 20 km south of Yarmouth, Nova Scotia, and 30 km west of West Pubnico where I live and dock my boat. A landing there can only be achieved when the winds and seas are relatively calm. There is no beach nor any great landing area on this island. An inflatable landing craft makes the procedure safer and easier and often the only way to get there at all. Upon landing, we attach a grapnel to the rock with a line running to the boat (my Royalsea-23), eventhough the boat is already anchored with one or two anchors. 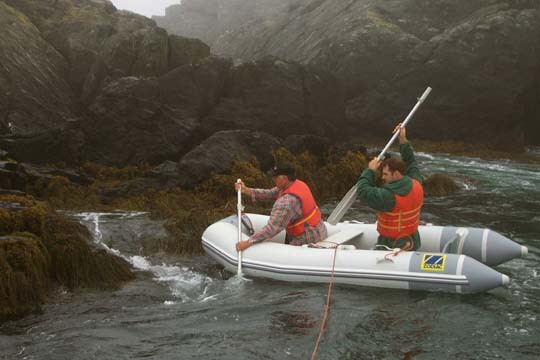 The current is always strong and we use the grapnel line to get the inflatable back and forth rather than the oars. I generally have no problem finding volunteers for my crew. The following is a chronological listing of my 2001 work with the Gannets of the Lobster Bay and the Gannet Rock area of southwest Nova Scotia, Canada. The report also includes Gannet observations from other local residents. 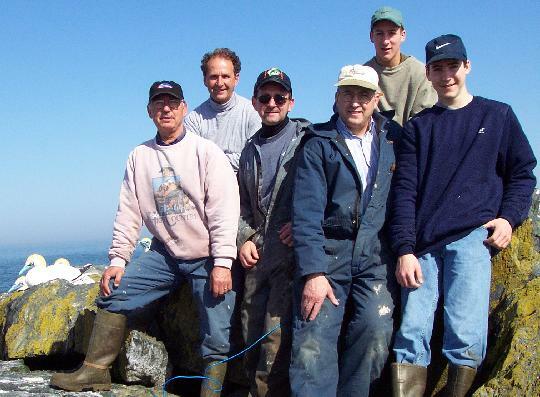 April 21, 2001 - 51 decoys were glued and tied to the rock. The sound system, on loan from Canadian Wildlife Service (CWS), was out for repairs and not installed on this day. 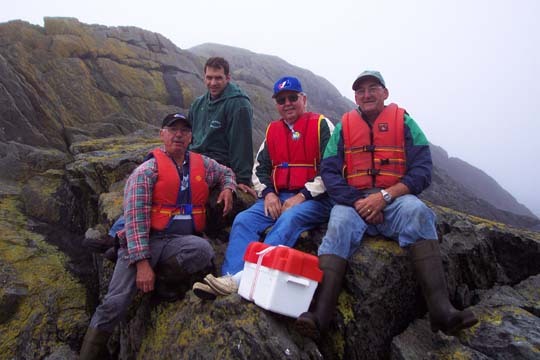 Crew: Andrew and his brother, Lester D'Eon, Rémi, Alix d'Entremont and Justin d'Entremont. We saw only 12 migrating Gannets while we were near Gannet Rock. There were perhaps 300 Common Eiders at Spectacle Island, the last island before Gannet Rock. 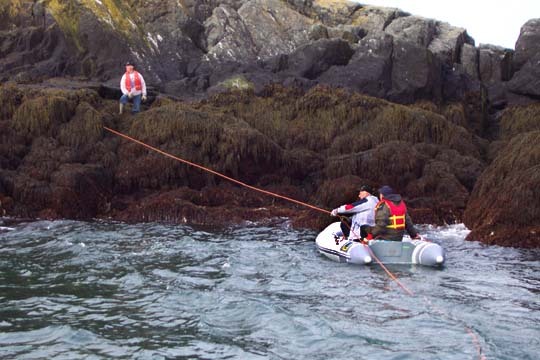 May 5, 2001 - An attempt to land on Gannet Rock failed. At about 3 km short of the rock, we decided to turn back and return to Abbott's Harbour, West Pubnico. The seas were getting increasingly rougher by the minute and the boat was bouncing about more than I would like it to. It would have been a difficult landing at best. Better to turn back and try again another day. This trip to the rock was to set up the sound system. I had replaced one of the speakers with a new one from Sigma Electronics of Dartmouth, NS. Salt water had gotten into the wiring connecting the speakers to the circuit board of the sound system. At first I thought the problem was only with the connectors to the speakers, however, upon further examination, black, water damaged wires were found all the way through the wiring. A local electrician, Philip D'Eon, gave me a length of suitable cable for the job and I replaced the total wiring including the connectors. All possible water entry points were generously covered with silicone rubber. We will see how that works out! We did see 2 or 3 migrating Gannets not far from Gannet Rock. Still many Common Eiders at Spectacle I. Of note were 5 Razor-bill Auks to the south of Gull island. This was the first time I have seen Razor-bills in that area. My crew: Andrew and Rémi. 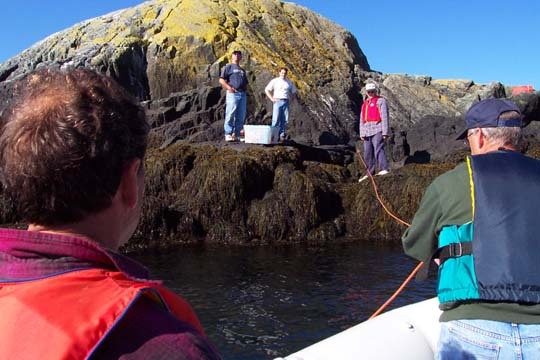 May 9, 2001 - The sound system was placed on Gannet Rock. All went well. 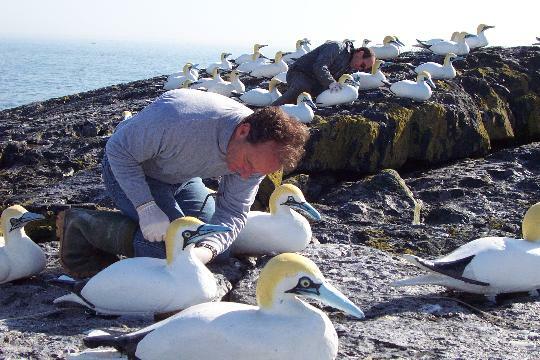 A number of Gannet Decoys had become unglued. Some more were damaged by pecking. We had brought two tubes of silicone rubber just in case of need. These were quickly used up. We even had to leave a few decoys unglued as the silicone ran out. 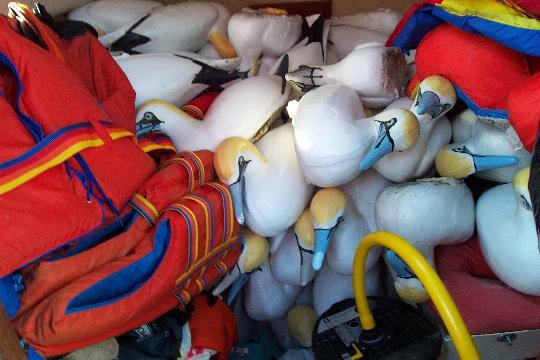 The 3 more severely damaged decoys were brought back home for repairs. A few Arctic Terns were flying above the rock as we arrived and there were many gulls with the decoys. 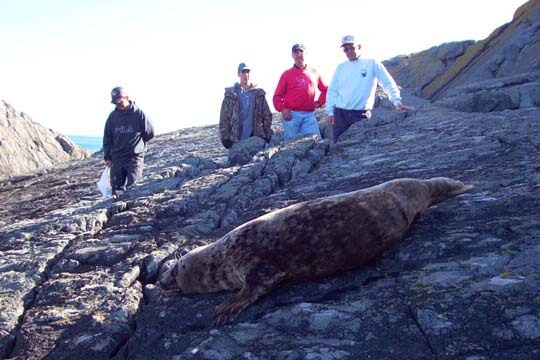 A recently shot Gray Seal was found on a rock ledge near our landing area. 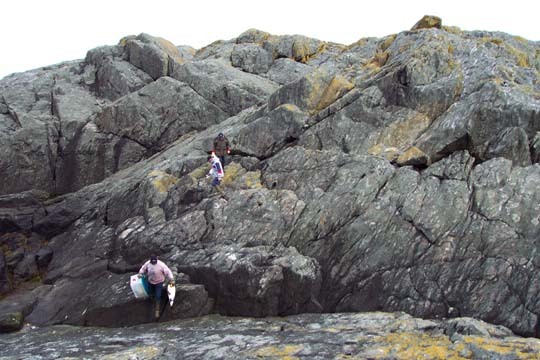 We then motored to Green Rock (Green I.) and estimated about 24 Puffins there. A couple of hundred Black Guillemots and a hundred or so Common Eiders appeared to be nesting there also. My crew: Rémi, Jean-Bernard d'Entremont and Michel d'Entremont. 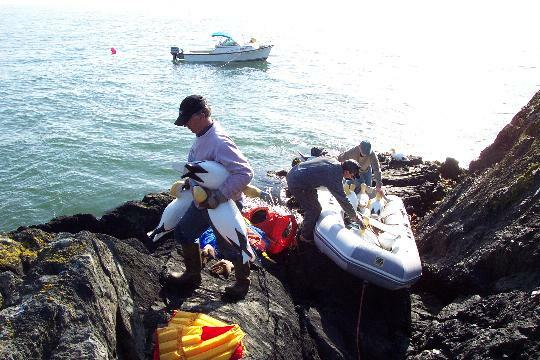 May 21, 2001 - Returned to Gannet Rock for another battery change. We could hear the sound system operating fine as we made our way up the rock. 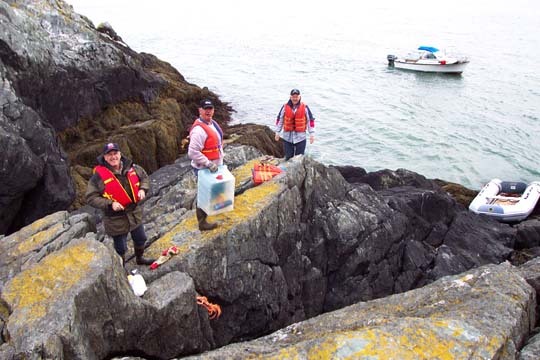 We had brought with us three repaired decoys to be reglued to the rock. This was done. A number of decoys which had become unglued were also reattached. A few Arctic Terns were seen in the air above the rock. 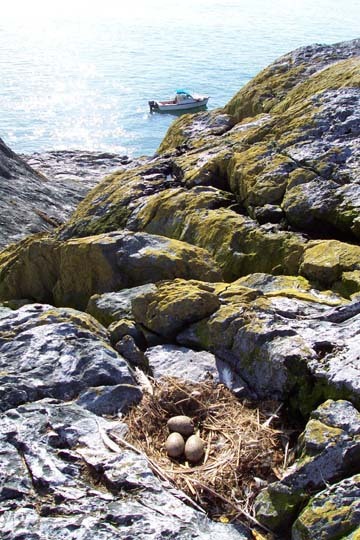 There were several Great Black-backed Gull nests in the process of hatching. No sign of Black Guillemot nests yet, though the birds were there. 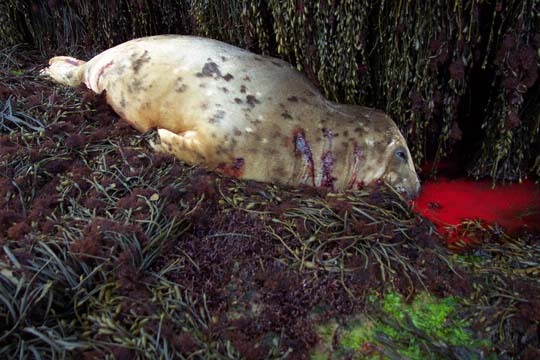 One possibly injured seal stayed on its ledge. Seals in general, were noticeably absent in the Gannet Rock area. We then sailed (motored) first to Flat I. where we saw a Blackburnian Warbler on the wharf. A few Arctic Terns flew above us. We found no Puffins there. Our first Puffins were seen on the east side of Round I. where we found 4. About 25 Puffins were at Noddy I. 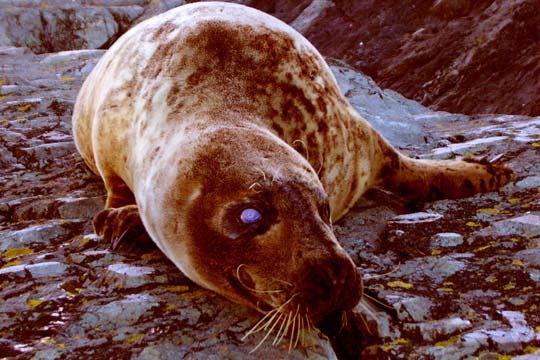 The seals were very plentiful at Noddy and on the rocks of south-west Mud Island - perhaps 200! Seventy-five Brant flew from Noddy I. as we approached. These were seen again on Mud. I. where we also found one Canada Goose and two`pairs of American Widgeons. An estimate of several hundred pairs of Common Eiders were nesting there. On our way back to Abbott's Harbour, West Pubnico, we counted 27 Gannets migrating in the direction of Cape Sable Island, on their way to Newfoundland or the Gulf of St. Lawrence. These were coming from the direction of Gannet Rock. My crew: Andrew, Rémi and Alix, with Alderic D'Entremont, Coral d'Entremont and Marcel D'Eon. It was a great day to be on the water and a wonderful trip. 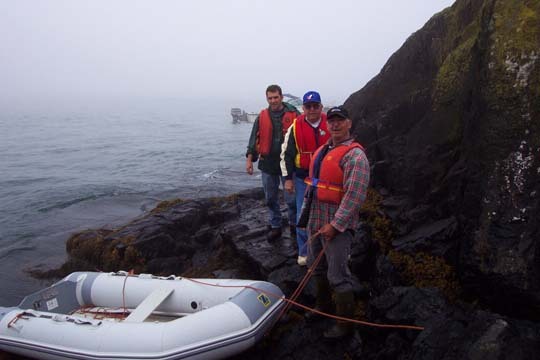 June 9, 2001 - Again to Gannet Rock for a battery change. Weather great. The sound system was off and did not switch on with the battery replacement. Upon further investigation, a blown fuse was found in the PVC box containing the CD player and amplifiers. Shorting the fuse would not revive the system. An electrical storm the previous couple of weeks zapped all the electronics aboard a lobster fishing boat fishing in the area. I expect it also got the sound system. The system was brought home for repairs. I will have to take it to Sigma Electronics, Dartmouth. 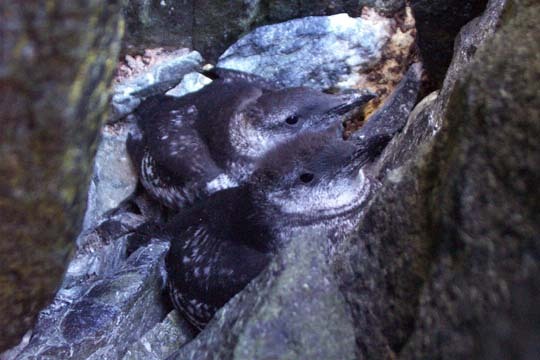 We did find 3 Black Guillemot nests on Gannet Rock and about 12 Gannets still migrating in the area. Most of the Gannets were immatures. My crew: Andrew, Rémi, Jean-Bernard, and my son, Nigel. 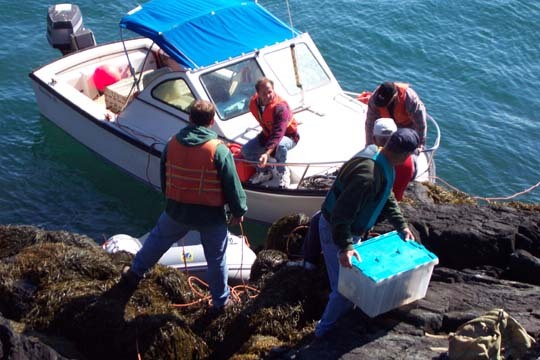 July 29, 2001 - The repaired sound system was set up again on Gannet Rock. Getting back aboard the Royalsea - calm seas for a change! My crew: Rémi, Jean-Bernard, and Basile d'Entremont, with Lester D'Eon and my brother, Roland. After Gannet Rock, we then motored to Flat I., Noddy I. and Seal I. before heading back to West Pubnico. August 16, 2001 - Another battery change. The weather was very foggy and the rock was very slippery and wet. However, all went well. Before heading back home, we went to Green Rock where we counted about 75 Puffins. 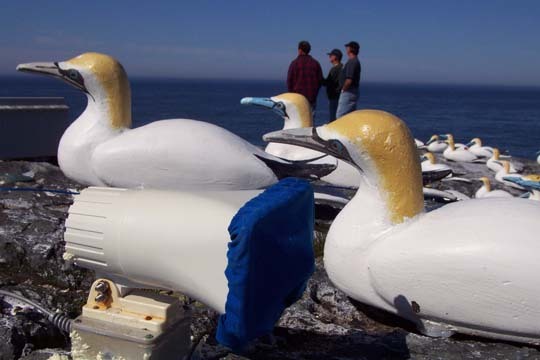 September 15, 2001 - The Gannet decoys and sound system were removed from the rock. 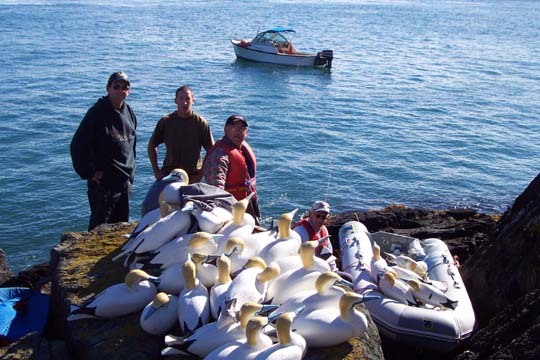 Fewer Gannets were seen the Lobster Bay area in the summer of 2001 than in 1999 and 2000. No Gannets were seen on Gannet Rock this summer. Due to the sound system being down for about seven weeks, fewer visits to the rock were made this year as compared to previous years. We will do it again next year. Each visit to Gannet Rock is an adventure in itself.